Ok, I know Spring isn’t officially here yet. At least, it’s not here in Michigan. But I have to tell you after a winter like we had this year, everyone around here has Spring Fever. Big time. And there’s no doubt it’s getting closer. Today the sun is out and it’s going to be, you won’t believe it…40 degrees. Of course for those of you living down South, you’re in Spring full fling. My dad called me yesterday from Louisiana to rub it in the fact that it was sunny and 85 degrees there. I know, he loves torturing me. 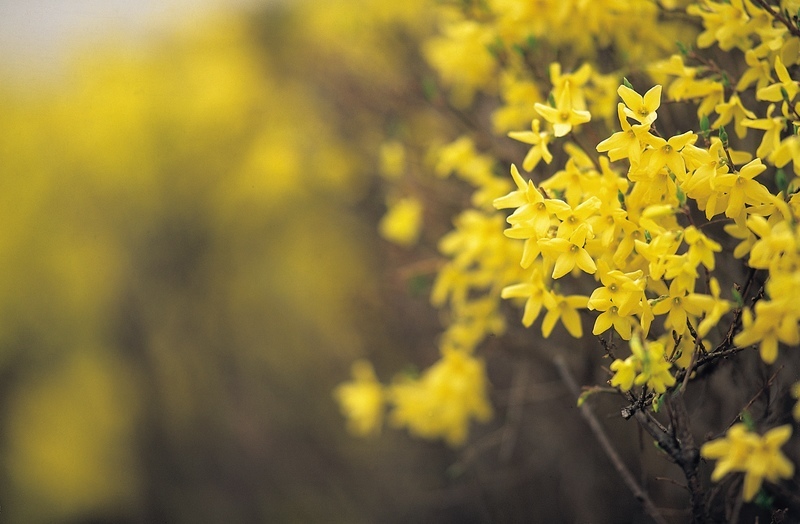 No matter where you live, you probably have a list of spring projects you want to get done over the next few months. I know my list is growing longer by the day. The good thing about spring projects is that many of them can help you save money and, you guessed it, go green. If you’re interested in growing your own food this year, you should be planning your spring garden now. And when I mean plan, I mean really plan. Sure it’s fun to imagine what fruits and veggies you’ll be planting, but you need to figure out where they’re going to go. You need to examine how much light every spot in your yard gets so you can maximize your planting space. Don’t forget, the trees don’t have leaves right now. When you’re looking at sun, make sure you look up. What’s sunny right now might be shade in a couple of months. This light/space consideration is something I didn’t think to do last year. So, my garden didn’t do as well as it could have. Right now I’m carefully looking at how much space I have to work with, and how much light every space gets during the day. I also have a problem with lack of sun. If this is your case as well, check out this awesome article from Mother Earth News: Best Vegetables to Grow in the Shade. I’m also trying to come up with creative ways to maximize my space. I’ll be attempting another vertical trellis garden this year, so hopefully the dismal failure that happened last year won’t happen again. Now that sunlight is finally starting to stream in through the windows, I’ve gotten the spring cleaning bug. But I’m not using any commercial cleaning products (I haven’t for years). My cleaning arsenal is 100% eco friendly. I use baking soda, vinegar, and lemons to clean my house. They’re cheap, I don’t have to worry about dangerous offgassing from chemicals, and they work great. This weekend, the house is getting cleaned from top to bottom. It’s supposed to rain and be in the mid-40s here (whoo-HOO!) so I’m going to throw open the windows for some fresh air (if only for 10-15 minutes) and get going. Truth be told, I’m actually really looking forward to it. Heavy cleaning (to good music) is great exercise, and the house always feels great when I’m done. Plants aren’t budding here yet. Not even close. But I’m ready to bring the outdoors in. There’s a huge forsythia bush in the yard so, I’m cutting branches and putting them in water indoors so they’ll bloom. This is a wonderful way to get some free greenery in the house. Now if any of you know of other outdoor plants I can do this with, could you please let me know? I’ve tried searching online to see what else I could bud indoors like the forsythia, but I must be using the wrong terms because I can’t find a thing. For instance, could you trim some branches from a lilac bush and bud them indoors? Or a pussywillow? Those would be delightful to have in the house! Now, I have a surprising bit of news. We’re no longer living in Detroit. Yep, we’ve moved back to our cozy little house in Howell. Why did we go back? Well, as many of you know we’ve had our house on the market almost two years now. No, that’s not a typo: that’s two years. It’s Michigan…you’ve all read the news. Well, we had it sold. Again. And it fell through. Again. So, we (fairly happily) conceded defeat, took it off the market, and came on back. Well, because now that I’m back in my own home again I’ve got also got an itch to do some creative redecorating. And, I’m going green to do it. Um, I’m not sure there’s a word that adequately describes this coolness. I would lovelovelove to do this on one of my walls. But the only problem is…how do you make the lids so they wouldn’t slice you to ribbons if you touched it? As amazing as this looks, it seems like it could easily be dubbed The Wall of Death without a creative safety intervention. If any of you dear readers has an idea about how to make this project safe, I’d love to hear it. This will be built and hanging on the wall behind my stove by Sunday. Guaranteed. Anyway, this is just a small, small sample of some of the projects I want to tackle this spring. Yep, I’m going to be a busy girl! What are you guys going to be doing this spring? Please write in and let me know…I’d love to hear about your projects! I *adore* the kitchen rack thingy! Now how do I keep it from getting dusty?? As for the wall of cans – generally the sharp side has a slight curve, no? I’d think you could aim the sharp side to the wall and be relatively safe once the thing is done. Gloves would definitely be required for assembly though! I have a battery-operated can opener (think it’s called a One-Touch — something like that), and it takes the lids off with no sharp edges. Slices them off from underneath the entire lid. The openers are good for people with fine-motor limitations (disabilities, arthritis, etc.) as you push the button and let go! Sorry to sound like a can opener ad!! I’m also getting antsy for spring cleaning. Even my cat’s been crying at the patio door — and he’s an indoor cat! Guess he just wants some fresh air. @Heidi- I know, I love it too! I think I’m going to make mine out of those cool cans of tomatoes (bright red and yellow) from Italy. I don’t know how you’d keep the dust out…I’m thinking I might use mine for flowers? 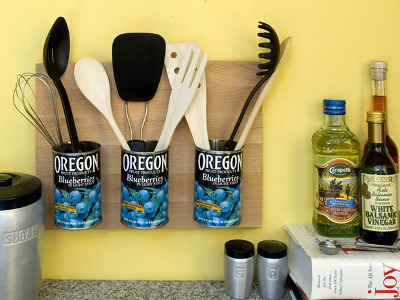 I already have a super cool vintage coffee tin holding my wooden spoons, but that little wall tin piece would look sweet holding some fresh flowers. Or…maybe I could plant moss or ferns in them…That would look cool too. @Isabelle- Thanks so much for the tip about that can opener. I forgot all about those! Maybe I can fine one at the Salvation Army. Tupperware sell an amazing can opener that leaves no sharp edges at all, I am in Australia though, not too sure if that will help you in your part of the world! Good luck finding one though, it would make a very impressive feature wall. Hello there! 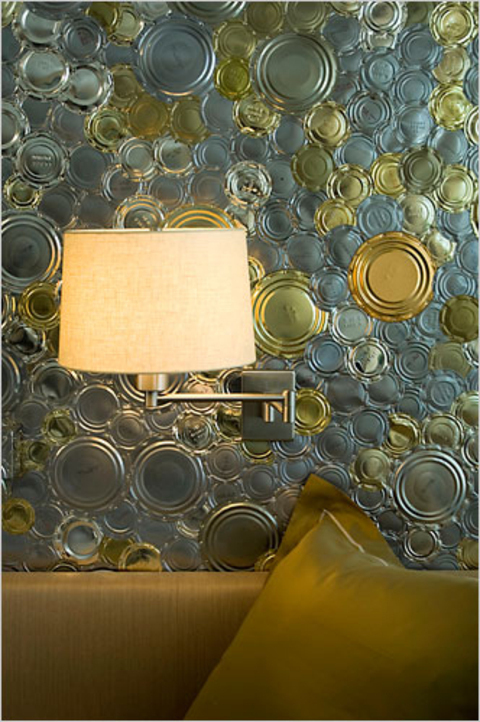 I am extremely interested in the tin can lid idea….I plan to do this to my kitchen! I am wondering how you applied these? Also did you apply a top coat of something? Thank you so much for your help! !